James Hughes and company are teaching much more than music composition and technique. The team empasizes the importance of community and collaboration. James Hughes, the soft spoken proprietor and unofficial face of Triumph Music Academy, has a passion for teaching and the collaborative spirit which the Academy embraces. His vast knowledge of music, both theory and practice, represents the entire staff of 10, three of which co-founded the Academy with him. "As much as I might appear to be the face of the school, that couldn't be farther from the truth. The school is everybody who teaches here. Their skills, their knowledge. I don't think we would have the successes without them," says Hughes. Triumph has recently been accredited with the Better Business Bureau. "We want to be an accredited school, not just with the Better Business Bureau, but with the national accreditation of music schools. We want to show that we're really legitimate so people can trust that when they come here they're getting the best possible education, extracurricular wise," says Hughes. 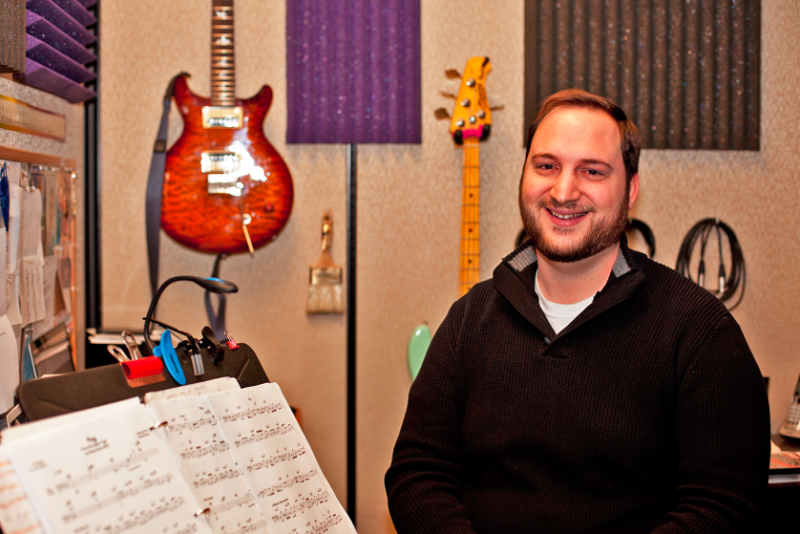 Hughes started the school almost three years ago, teaching out of his apartment as well as practice rooms at Grand Valley State University (GVSU) and Grand Rapids Community College (GRCC) to supplement his income. Before long he had outgrown his apartment and reached out to friends and professional musicians Kyle Thompson, Jeremy Verwys and Matt Gruppen. The idea was to fill a gap between guitar shop lessons and academic training with an emphasis on guitar. It soon became apparent that there was more of a gap that included a variety of instruments. 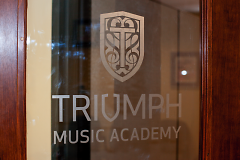 Today Triumph employs 10 staff, with the highest paid extracurricular music instructors in town according to Hughes, that collectively cover a broad range of instrumentation and styles. Five of the instructors teach guitar in various genres including acoustic, classical, jazz, rock, progressive, metal and bluegrass. "You name it, we do it," says Hughes. Other instruments in the Triumph repertoire include electric and upright bass, piano, synthesizer, mandolin, banjo and ukulele. The Academy teaches voice lessons, composition, song writing and arranging. The bar is set high for the instructors, with a thorough criteria that must be met. In some cases the process can take up to three months. Most of the instructors have a collegiate background, but that isn't necessarily a requirement. Hughes looks for professional, working musicians that can demonstrate their ability to comprehend a multitude of musical facets as well as having strong people skills. "There's quite a long vetting process. We take super great care to who we bring on board. Not only do they have to be a respectable performer around town, they also have to be able to connect and make bonds and build relationships," says Hughes. "It's hard for me to be okay with saying that I have a lesson school. We're more like a mentorship facility. We like to take people under our wing and kind of help introduce music in a way that enriches people's lives." About one third of the 200 plus students are adults, although the range in age is anywhere from under 10 years old to over 70. "We want to have a campaign -which we're currently formulating- to make it known that we specialize in adult education as well as specializing in other things. I don't think a lot of people recognize that as an adult you can take music lessons and there is a place for that," says Hughes. With a broad spectrum of demographics comes a varied intent that Hughes says knows no limits. "When people come here they have an inexhaustible myriad of requests of what they want to do. Everyone that teaches here is really open and super well versed in everything from noise music to minimalism to more structured classical and jazz," says Hughes. 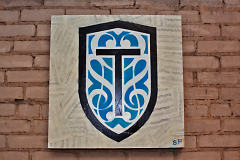 Triumph is also building bridges between lessons and performing and has started a year round band program, teaming musicians together and booking gigs around town. Currently there are two pre-teen rock bands, a teen cover band and an 80's band. An all girl band is also in the works. Another facet of Triumph is the DJ and production program. Both programs are designed to get musicians engaged in the community, building exposure and experience in the business. 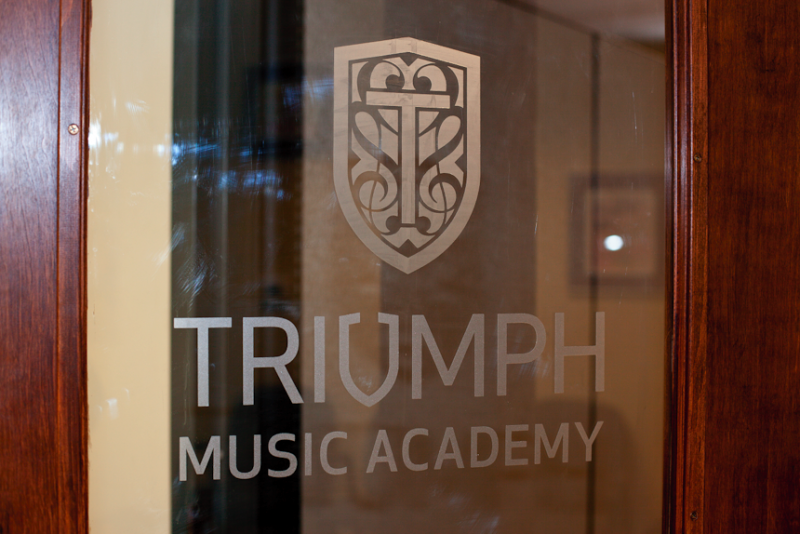 Triumph teaches how to approach a venue, record demos, as well as marketing needs like designing and printing flyers and distribution. "Our mission is to remove the simulation aspect and have them go do it," says Hughes. Triumph wants to be on the forefront of progressive action. And that starts with the day to day things. Any paper used is recycled by participation in the SORT program and "all of our front end operations are completely paperless," says Hughes. "We're trying to be leaders in everything we do. 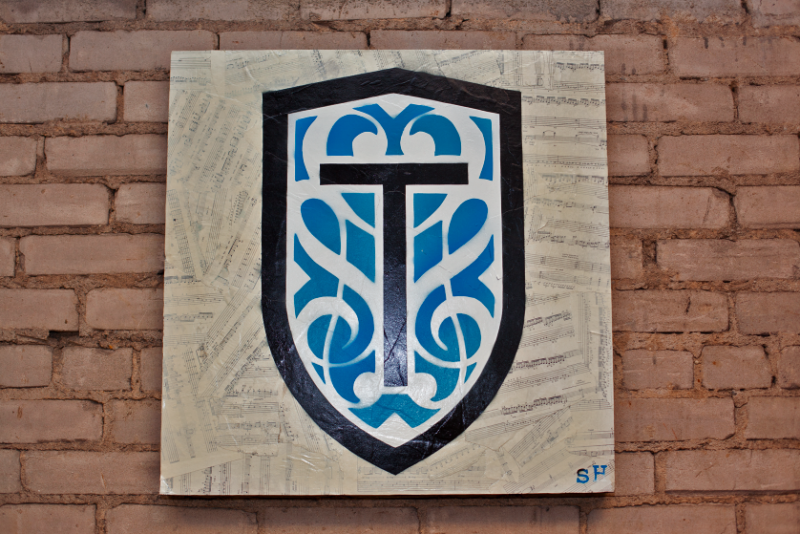 We're trying to term ourselves as West Michigan's progressive music school. What that means is that it starts with the space that we're in. It's (the Bazzani building on Wealthy at Diamond) the first LEED certified business structure that was renovated in Grand Rapids," says Hughes. "So we wanted to be in a green building." Hughes was born in Southfield, Michigan. He spent his childhood between Brighton, Michigan and Prato, Italy, where his mother is from. He went to high school in Battle Creek and upon graduation spent a couple of years touring with rock bands. Hughes moved to Grand Rapids in 2004 where he attended GRCC for guitar. From there he went on the GVSU to study guitar and composition under Carlos De la Barrera and Dr. Bill Ryan. "I wanted to put together a school that's not about storefronts. It's not about signs; it's not about profit. Everything -even though we're listed as a for profit company- everything that we're doing is trying to benefit the community," says Hughes.